Buying in Bulk? Do you do it? Oftentimes you can save money on buying the bigger size product and sometimes it is more expensive to buy the bigger size depending on what deals or promotions are available. I was shopping recently and noticed a glaring difference in buying the larger size versus buying the smaller size. In my situation it saved me money by buying the larger size instead of two of the smaller sizes. 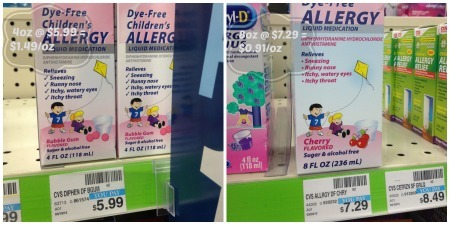 In this situation for our family, I choose the cheaper per ounce price since I know it’s something we will use. If it isn’t something we would use the entire bottle, I’d go for the cheaper out of pocket item. Obviously, I would have done much better if I had used Extra Care Bucks or waited for a sale but since I couldn’t, I went for the best deal I could find!